© 2019 Ogbonmwan I, et al. This is an open-access article distributed under the terms of the Creative Commons Attribution License, which permits unrestricted use, distribution, and reproduction in any medium, provided the original author and source are credited. Biomechanical characteristics have been recurrently associated as aetiological factors in Achilles tendinopathy. Despite this, no study has investigated the relationship between biomechanics and clinical severity. To establish whether an association exists between Achilles tendinopathy clinical severity and biomechanical kinetic and temporospatial variables. Design: Observational cross-sectional cohort study. 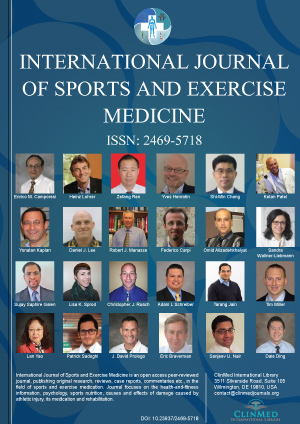 Twenty-four participants with mid-portion Achilles tendinopathy. Main outcomes: Gait kinetic and temporospatial parameters were measured using an instrumented treadmill. Clinical severity was measured using the Victoria Institute of Sport Assessment-Achilles Questionnaire. Overall clinical severity was reduced in participants with a greater step length (B = 2.144, p = 0.04) and a greater anteroposterior displacement of center of pressure (B = 0.117, p = 0.02) and increased in individuals with a greater step time (B = -343.861, p = 0.05). Pain was greater in participants with a greater weight acceptance peak index (B = -1.058, p = 0.046), impulse (B = -0.108, p = 0.04) and active force peak (B = -0.102, p = 0.025) and reduced in participants with a greater weight acceptance rate (B = 0.004, p = 0.024), stride length (B = 0.374, p = 0.049), step length (B = 0.0755, p = 0.044) and push-off rate (B = 0.003, p = 0.038). Function was reduced in participants with a greater weight acceptance peak index (B = -0.905, p = 0.014) and greater double support time (B = -198.526, p = 0.040). Significant correlations between biomechanical parameters and Achilles tendinopathy clinical severity exist. Biomechanical variables identified in this study should be investigated in larger cohorts prior to determining clinical applications. Ikponmwonsa Ogbonmwan, Institute of Sport Exercise & Health (ISEH), University College London, London, UK.